Mike Aspinall ruled out recruiting players from other clubs to supplement his depleted Harrogate back line. Matt Landsill’s injury before Saturday’s game against Chester added to a long list of backs in the treatment room at Rudding Lane. First team members Luke Edwards, Barry Frost, Harry Parrish, Charles Morgan and Steve Parsons are all suffering from injuries, leaving director of rugby Aspinall with limited options ahead of Sale’s visit to Harrogate this weekend. However, with resources thin on the ground, Aspinall said Gate’s financial state would not allow him to look elsewhere even if he wanted to. Aspinall said: “Over my time at Harrogate we have often had an issue with strength in depth in the pack but not so much with backs. This injury list is pretty testing from a back line point of view. “We are not in a position to recruit from a financial point of view. I’m more interested in trying to push the players that are working with us already rather than scouring through other peoples. With Tom Harvey banned for Sale’s visit, Jonny Coser likely to switch from openside to blindside, with brother Guy and Tim Heaton both in the frame to return to the first team fold. 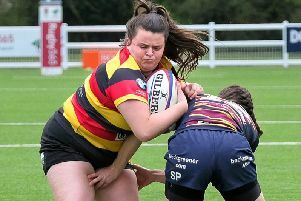 Harrogate edged past Sale by three points earlier in the season but the Greater Manchester side head into the clash on the back of successive wins.